a sleeveless apronlike garment worn over a child’s dress. •a collarless sleeveless dress, tied or buttoned in the back and typically worn as a jumper, over a blouse or sweater. a woman’s loose sleeveless garment, typically full length and worn over clothes to keep them clean. Romwe is one of my favorite online street fashion shops that carries a wide variety of women’s clothing & accessories. Pinafore Denim Dress With Pockets ($36.99 $15.99) Comes in Pink, *my favorite, Blue Jean, White or Black. Cat Print Contrast Stitch Overall Dress ($36.99 $15.99) isn’t this adorable? almost too cute to be for an adult, I would wear this plus I would put it on my 5 year old if it came In her size. And this one comes in Xtra-Small. Self Tie Shoulder Animal Pattern Pinafore Dress ($36.99 $15.99) Equally as adorable as the black one. Possibly even cuter. Button Side Solid Overall Dress ($39.99 now $14.99) probably my favorite, are you getting the sense I like these dresses in light pink? This looks so comfortable and it’s ALWAYS a plus when the piece comes in xs. I will probably be purchasing this one. Now I just have to find the perfect shirt to wear underneath it. 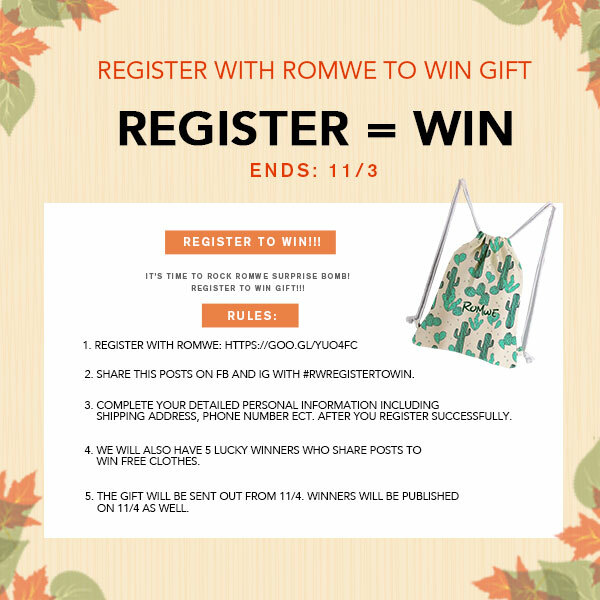 Right now if you register at Romwe, & follow the guidelines below, you could be one lucky winner who will win a free gift. Runners up will also be winning free clothes. Good luck!! !